Tesla has been told to drop the Autopilot brand name, which it uses to promote its driver-assistance software, in Germany. 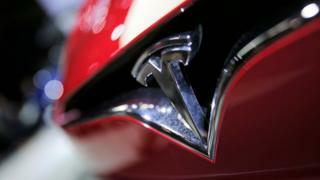 The Federal Motor Transport Authority (KBA) confirmed it had told Tesla to scrap the "misleading" term. It said the term gave customers "incorrect expectations" that they could stop concentrating on the road and let Autopilot take over completely. Tesla said it had always told drivers to keep their hands on the wheel. However, Tesla has been clear that the feature should only be used on the motorway, and drivers must still pay full attention to the road. The firm has been under scrutiny after one of its vehicles running Autopilot crashed, killing the owner. "It can be confirmed that a letter to Tesla exists with the request to no longer use the misleading term Autopilot for the driver-assistance system of the car," a KBA spokeswoman told news agency Reuters. According to the German newspaper Bild am Sonntag, the letter to Tesla said: "We demand that the misleading term Autopilot is no longer used in advertising the system." In a statement, Tesla said the term autopilot had been used in aviation for decades. "Tesla's Autopilot operates in conjunction with the human driver to make driving safer and less stressful. This is how the term has been used for decades in aerospace: to denote a support system that operates under the direct supervision of a human pilot," the company said. "We have always been clear with our customers that Autopilot is a drivers assistance system that requires the driver to pay attention at all times. "Just as in an airplane, when used properly, Autopilot reduces driver workload and provides an added layer of safety when compared to purely manual driving." The company's co-founder Elon Musk had been expected to make an announcement related to Tesla on Monday, but he has now tweeted that it has been delayed until Wednesday for "refinement".